The New School for Social Research (NSSR) is a graduate institution in the heart of New York City. It generates progressive scholarship and historically grounded education in the social sciences and philosophy. With more than 75 full-time faculty members, its ten departments and programs offer masters and doctoral degrees to 800 graduate students from 70 countries. 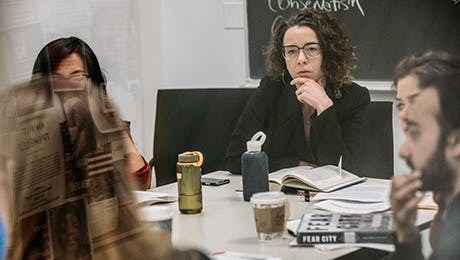 Interdisciplinary centers and institutes housed at The New School for Social Research provide further opportunities for deep inquiry and innovative collaborations, particularly at the intersection of social theory, policy, and design. The New School for Social Research believes that research and pedagogy should advance economic justice, promote an understanding of change, and train the next generation to influence public debate. Its commitment to progressive values, academic freedom, rigorous scholarship, and critical theory in the tradition of the Frankfurt School lies at the heart of The New School's history and draws upon the vital legacy of the University in Exile. While maintaining long-standing strengths in continental philosophy, psychology, political economy, ethnography, historical studies, and the analysis of social movements, The New School for Social Research continues to innovate in fields like migration and mobility, capitalism studies,gender and sexuality studies, creative publishing and critical journalism, and design and social thought, demonstrating its desire to remain engaged in the most important issues and debates of our time. The New School was founded in 1919 by a group of progressive intellectuals looking for a new, more relevant model of education. Our history and guiding principles-inspired by progressive American thought, European critical theory and the legacy of the University in Exile-remain as critical today than ever before. The New School for Social Research's acclaimed research and work carries forward our tradition of groundbreaking inquiry. Learn more about the individuals and projects that maintain our place at the leading edge of intellectual culture and distinguish our community of changemakers who foster social good through bold thought and action. Welcome to The New School for Social Research, where you come not just to study but to absorb a world and an ethos of challenging academic orthodoxy and asking big questions about society. The leadership team sets the course for the academic, intellectual, and creative rigor at the New School for Social Research. Committed to creating an inclusive community, the leadership teams helps foster an environment in which students challenge convention through scholarship and creative exploration. At The New School for Social Research, benefactors help to continue the grand tradition of philosophically-informed, historically-rooted social science graduate education. This generous community helps to advance critical work and enhance the experience of our students.